The Steingruebl family is pleased to announce that we have made the acquaintance of at least two of the neighborhood hummingbirds. Elise and Heather came home from story time at the library to find Flapjack glued to the window watching this little one. As near as anyone can figure, the cat didn’t leave the window except for water and litter box breaks between noon and 6pm. That’s a long day for a kitty! She has, as of this writing, decided to turn in early for the evening. Presumably, this is to be well rested for tomorrow’s attempts to hurl herself through the thermal pane window. 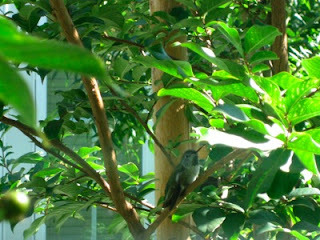 So-our visitors appear to be Anna’s Hummingbird, Calypte anna. We’ve seen two females at one time, but a male may have visited this afternoon. Heather couldn’t tell because the cat kept getting in the way. In fact, out of 7 pictures taken, the only one that wasn’t blurred beyond recognition by cat intervention is the one you see above. Elise will tell you that hummingbirds eat nectar. She also squeals with delight when she sees one at our feeder. Then she just gets frustrated that the things are so scared of a cat lunging at them from a distance of 7 inches. Hopefully, the birds will get used to the cat’s hungry stares and start ignoring her. It’s been a loooong time since we’ve seen Flapjack so excited about anything. In fact, this is about on par with the day we brought Beaker into the family. So, we’ll try not to go on and on and on about the hummingbirds, but they sure are neat and everyone seems to be enjoying having them around!